MOSCOW, May 20. /ITAR-TASS/. Repair works were in progress at a railway stretch in the southwest of the Moscow Region, where two trains collided on Tuesday afternoon, leaving at least six killed and 25 injured, a spokesperson for the Moscow Transportation investigation department said. “The investigation established that repair works were underway at the given stretch of the railway shortly before the collision,” Tatyana Morozova said. A passenger train collided with a freight train between the stations of Bekasovo and Naro-Fominsk, located on the Kiev-bound railway some 50 kilometers (34 miles) from Moscow’s center at around half past noon Moscow time (8:30 GMT). Sixteen cars of the freight train derailed near the station of Bekasovo and crashed falling into the passing by passenger train en route from Moscow to Chisinau eventually smashing two of the train’s cars with people inside. The Moscow Department of Transportation earlier reported that the accident had been caused by a distorted railway. The Interior Ministry reported that there were about 400 people in the passenger train as the total number of tickets sold stood at 394. Vadim Andronov Head of the Naro-Fominsk district, Moscow Region Prime Minister Dmitry Medvedev ordered Vice-Premier Olga Golodets to make everything necessary to help the people affected. 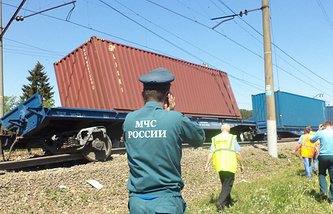 The cause of the train accident near Moscow was the disconnection of container freight train which damaged passenger train, Russian Investigative Committee representative Vladimir Markin said earlier.